As a boy, he wanted to study the humanities: philosophy, literature, poetry. But Donald Seldin grew up during the Depression, and he needed gainful employment to contribute to his family’s finances. So in his last year of college, he started taking science classes. He went to the Yale School of Medicine and, after a stint in the Army, joined the faculty as an Instructor of Medicine. In January 1951, at the age of 30, he left Yale for a job in Dallas, at the newest medical school in the country. He drove from Connecticut to Dallas with his wife and daughter in a big, lumbering Kaiser. He’d never been to Texas and was curious to see the school’s facilities. When he got to the corner of Maple and Oak Lawn, the young doctor pulled into a filling station. He asked the attendant how to get to the medical school. The attendant gestured in the vague direction of a railroad overpass down the road. Seldin drove on, but he found nothing but ramshackle military barracks, a dilapidated brick building, and garbage strewn in front of the entranceway. He returned to the filling station, and told the attendant that all he’d seen were shacks and trash. Seldin drove to a motel for the night to think the situation over. When recounting the story in meetings and to friends, he never failed to mention how naive he felt that day, how he wished he’d come to see the school before accepting the job. There were holes in the wooden floors and windows that wouldn’t shut. When it got cold enough, they couldn’t do experiments because everything in the lab would freeze. “It was a hell of a place,” Seldin would tell people later, the accent of his native Coney Island prominent. He was tall and lean and had a wry grin. Things got worse before they got better. Soon, the most well-respected faculty member at the young school, the surgeon Carl Moyer, left. (Presumably for a place without so much garbage on the grounds.) Then, the only faculty obstetrician took a job at the University of Illinois. The pediatrician went to Rochester. And Dr. Charles Burnett, who had recruited Seldin to Dallas, announced that he was accepting a job in North Carolina. Within six months of his arrival, Seldin was the only full-time faculty member—which meant he was also the chair of the Department of Medicine. Under Seldin’s direction, UT Southwestern Medical School would go on to produce some of the most important medical research in the world. He was hardly alone, but no other individual is more responsible for this transformation than Seldin. His three-pronged approach to research, patient care, and instruction changed the medical discipline forever. Today, there are five Nobel laureates at UT Southwestern (plus a sixth who got her start there), more than $400 million in annual research funding, and an endowment worth more than $1 billion. It’s hard to say which circumstances produced Donald Seldin, someone with that special combination of knowledge and ambition, work ethic and political skills. But one moment early in his medical career had a lasting effect. Before he came to Texas, before he was an instructor at Yale, Seldin got a lesson in the power of medical knowledge. This story doesn’t appear in his UT Southwestern bio. His friends and colleagues don’t discuss it much. In 1947, having just completed his medical training, Seldin was a captain in the U.S. Army, stationed in Munich, Germany. He was summoned to Dachau to testify as an expert witness in the trial of a Nazi doctor. The German officer physician was accused of murdering more than 30 people by performing liver biopsies. The court had established that all of the patients had died following the biopsies, and Seldin, just 27 at the time, was brought in to address the state of the procedure as viewed from the medical community. The court wanted to know: were there any therapeutic benefits to the patients? Was it an experimental procedure? Should it have required informed consent? The German doctor, an intelligent, eloquent man in his 40s who had done a fellowship at The Rockefeller University, was offered an attorney but decided to defend himself. He was allowed to challenge Seldin’s competence as an expert witness. With Seldin on the stand, the German produced a medical textbook and began asking detailed questions about various laboratory procedures. It just so happened that the textbook, titled simply Methods, had been co-written by a doctor who had taught Seldin at Yale. After about a day of questioning, the court ruled that Seldin was indeed an expert. So the German began to probe the witness’s knowledge of liver biopsies—at which point young Seldin delivered a disquisition on the entire history of liver biopsies up to that point, starting with the procedure’s initial development in Chicago. In the 1940s, this was an experimental procedure only; there was no known therapeutic function. Seldin explained that a biopsy wouldn’t influence a treatment, that it wouldn’t influence a prognosis, and that there was no clinical value. He felt that removing portions of a patient’s liver in these cases was tantamount to torture. Based on three days of Seldin’s testimony, the German doctor was convicted and sentenced to death. Later, Seldin would talk about the horror of seeing medicine employed to torment people. The German physician had struck Seldin as dignified, intelligent, crisp—and morally detestable. It made an impression. Such despicable doctors, he always thought, were an indictment of the entire German society. 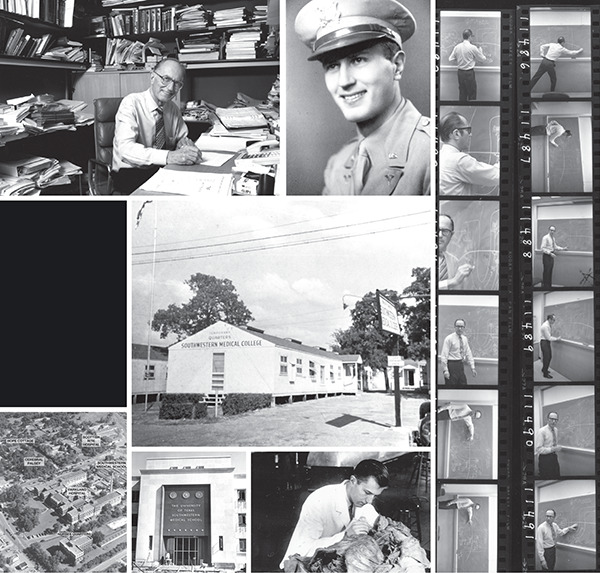 For years, Seldin would stress to both students and faculty the importance of integrity, of practicing humane medicine. At first, Seldin didn’t think he would stay in Dallas. He got some feelers from Harvard. He had an offer to go with Burnett to North Carolina. Yale wanted him back. At one point, Seldin even had his wife, Muriel, go back to New Haven to look for apartments. But the school hired a new dean, a man named George Aagaard. Seldin spent time with him (which wasn’t difficult, as the lone faculty member) and would later describe him as “a very fine man.” Then, Dallas County appropriated funds for a new Parkland hospital on Harry Hines Boulevard, where it stands today. Just under 16 acres of land had been donated to build a school. The money was flowing. Around the same time, Governor Allan Shivers, a conservative Democrat, visited the school in all its dilapidated glory. A window fell off a building and almost hit him. In a special session, the governor and Legislature appropriated money for the first building of the new medical school. Seldin still didn’t have a full-time faculty or facilities that would ever lure anyone from anywhere reputable. But he did have a cooperative local physician community. Several clinicians donated their time to give lectures and review cases with students. Students might see him doing rounds at 3 am, and when he was done, he would give lectures about what he’d seen that night. He ate lunch with the students and took a personal interest in their lives. Because he worked intimately with the students, he was able to pick out the brightest of the bunch. He would take them aside and explain: he had a vision. Seldin came up with another way to enrich his talent pool. He liked to send off his best students after their initial medical schooling, have them study with the top minds in the country. Seldin would make the arrangements—he seemed to know everyone in academic medicine—with the promise that the students would return to Dallas to join the faculty and help start new programs at the school. There was Floyd Rector, Jean Wilson, Daniel Foster, Norman Kaplan, Joseph Goldstein. He knew who should go where and what he should study. Each would go on to become famous in the biomedical community. He convinced Goldstein, who wanted to go into neurosurgery, to study genetics instead. Seldin wanted Goldstein to leave, learn from the best, and come back to start a genetics department. (There were only two in the country at the time.) Eventually Seldin encouraged Goldstein to partner with Dr. Michael Brown, another superachiever. The two shared the Nobel Prize in 1985, and their discoveries led to the development of cholesterol medications taken by more than 30 million people worldwide. There was some resistance—a few clinical physicians felt pushed out by the younger academics; some politicians refused funds from the federal government—but momentum built, and by the 1960s, young superstars of science were patrolling the halls of UT Southwestern. Because he’d known so many for so long, he engendered a loyalty and dedication to team spirit that are rare at the highest levels of academic research. The faculty was expected to show up early and work deep into the night. While Dr. Michael Brown’s wife was in labor at St. Paul, he ran over to the labs to see the results of that afternoon’s experiments. Dr. Brown once gave a talk about a great breakthrough. He thought it was fantastic. But as he lectured, he noticed Seldin sitting there, looking uninterested. Afterward, Seldin ushered Brown into an office. “That was a terrible talk,” Seldin told him. Then, Seldin rearranged Brown’s slides, discarding a few he felt were irrelevant, and showed him how the lecture should have gone. They were still at the office at 9 pm, when Muriel called to tell Seldin he’d missed his supper. One day, Seldin pulled Hobbs aside and asked her what she wanted to do with her career. She told him she expected to become a practicing endocrinologist, that she was too social to be a researcher. Seldin shook his head. He told her that wasn’t what she should do. She should become a scientist, he said. She should train with the best, in the Goldstein-Brown laboratory. She took his advice and has gone on to a career full of accolades. In 2007, she was elected to the National Academy of Sciences, the most esteemed medical organization in the country. Seldin incorporated his own family into his career, and his wife and three children—two daughters and a son—were well-known among the top scientists in Dallas. He also treated many of his former fellows like sons and daughters. He would take students to lunch in his old Kaiser and have parties at his house. Every year, the fourth-year students at the medical school made a senior film, and, every year, Seldin was invited to play a part. One year, the film was called Seldinfeld, and he stood on a stage, in a jacket, parodying Jerry Seinfeld. One year, the film was a take-off on Star Trek called Wrath of Don. His favorites were the Godfather parody and the Casablanca parody called Play It Again, Don. Muriel was a pianist, so they were familiar faces in the budding local classical music scene. Seldin and Dr. Kern Wildenthal, the former president of UT Southwestern, would argue over which was the higher art form, string quartet or opera. Seldin also knew several young local artists, politicians, businessmen. On a recent Wednesday, 92-year-old Dr. Donald Seldin rose from his desk in his fifth-floor office and headed downstairs. He ambled, only a little less agile than his days as a ballroom-dance instructor. Seldin was on his way to the large lecture hall, not far from where a painting of him hangs in the lobby. He went to welcome the new class of first-year medical students—a class of more than 200—as he does every year. Most of the young people walking the halls of UT Southwestern don’t realize who he is or what he has done, an indication of just how massive the place has become. Seldin has been the president of seven medical or scientific societies. He has six honorary degrees, including one from Yale. He made seminal discoveries in nephrology and was instrumental in establishing the discipline. He has collaborated on the classic textbook on the kidney. And, most important to him, his students have brought his brand of humane medical science to hospitals, private practices, and medical schools all over the world. Muriel died in 1994, and friends worried about him. Four years later, he married Dr. Ellen Taylor, a former student and fellow classical music fanatic. Seldin doesn’t use cellphones or the internet, but he reads constantly: history, literature, a compendium of medical journals. And he still speaks poetically. There, in his words, you could hear the influence of that time in Germany, his vision of what a medical school should be. He spoke about the physician’s duty to a patient, about the broad explanatory principles of medicine, and about the powerful instrumentality of medical knowledge. He spoke for about 10 minutes. Near the end, he paused. He wanted to say something about UT Southwestern, the institution to which he has dedicated his life, the school he guided from those decrepit shacks to this perpetually growing campus—from mediocrity to world renown. He scanned the room. The potential here, the possibilities for the future of science—he may have been more eager than the students. He grinned. Then, he returned to his office, where some research awaited him.